Home Innovation A Solution for the Space Junk Problem? A Solution for the Space Junk Problem? Experts predict near-Earth space will become difficult to navigate by mid-century unless agencies start removing the mess. Gassy outbursts from a suborbital rocket may be the cleanest way to get rid of hazardous space debris, suggests a new US patent application filed on 27 September by aerospace giant Boeing of Chicago. Space junk – derelict rocket bodies, broken or used-up satellites and debris generated by their endless collisions – is becoming the scourge of the space age. Even tiny pieces can zip through metal at hypersonic speed, putting astronauts and spacecraft at risk. 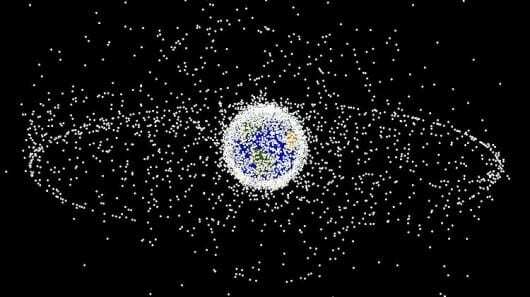 After more than 50 years of space flight, so much litter has accumulated that some experts predict near-Earth space will become difficult to navigate by mid-century unless agencies start removing the mess. Most space junk can burn up safely during re-entry into Earth’s atmosphere, but that means something needs to nudge it out of orbit. The trick is, how do you deliver an orbital clean-up crew without adding more rubbish? So far, ideas for sweeping up near-Earth space include attaching sails to derelict satellites to slow them down, sending tentacled janitor robots to drag junk out of orbit or deploying enormous robot-pulled nets to trawl for debris. One problem with nets, sails and janitor bots is that they need lofting on orbital rockets that themselves could leave behind space litter. Boeing’s plan suggests sending up a rocket carrying a tank of a cryogenic inert gas such as xenon or krypton. At the top of a trajectory designed to intercept a swarm of space junk, the rocket would vaporise its payload and “fire” up to 10 tonnes of gas through a special nozzle. This cloud would dissipate in seconds, but its initial density would create enough drag to slow the debris, Boeing inventor Michael Dunn says in the patent.